I'm always looking for research on the fascinating behavior of the nonhuman animals (animals) with whom we share our magnificent and diverse planet, and here's a summary of some very interesting research on fish to kick off your weekend. Fish usually get the short end of the stick in discussions of their cognitive and emotional lives. However, their behavior is much more complex than most people have ever imagined. I've previously written essays that call into question the misguided and uninformed notion that fish are "lower organisms" who aren't very smart or who don't feel pain (see, for example, "Fish Use Referential Gesture to Communicate During Hunting", in which I discussed research showing that groupers and coral trout signal the location of hidden prey with their head, and "Fish Are Sentient and Emotional Beings and Clearly Feel Pain", in which I wrote about new research showing that fish are sentient and feeling beings). Victoria Braithwaite's research on pain in fish also is relevant here. In her landmark book called Do Fish Feel Pain? she wrote: "I have argued that there is as much evidence that fish feel pain and suffer as there is for birds and mammals -- and more than there is for human neonates and preterm babies." (page 153). Per capita success rate was significantly higher for cooperative hunters when compared with solitary ones, with hunt responders assisting hunt initiators in cornering the prey using their large extended pectoral fins. The initiators would most often take the first strike at the group of prey, but both hunters would then alternate striking at the remaining prey. 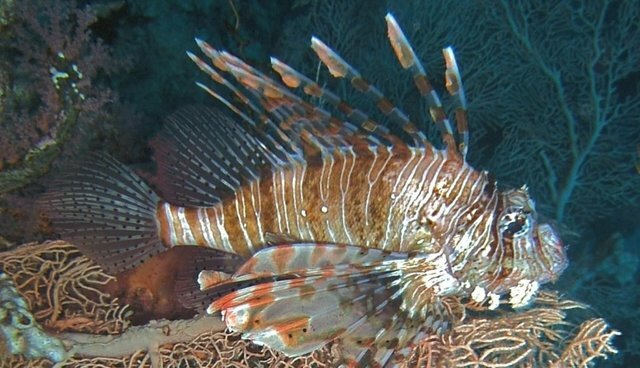 Results suggest that the cooperative communication signal may be characteristic to the lionfish family, as interspecific hunters were equally coordinated and successful as intraspecific hunters. Our findings emphasize the complexity of collaborative foraging behaviours in lionfish; the turn-taking in strikes suggests that individuals do not solely try to maximize their own hunting success: instead they equally share the resources between themselves. Communicative group hunting has enabled Pteroine fish to function as highly efficient predators. A good summary of this research can be found here and it has also drawn a lot of attention because of its unique and very significant findings. The results can be succinctly summarized as follows. Lionfish use a clear action during which "they shimmy their tails and fan out their fins" to recruit other lionfish to hunt (they don't do this when they are alone or if potential prey isn't around), fish who hunt together cooperate and catch a bigger meal than each would have caught alone, and the fish take turns sharing food. When the fish are alone they swallow prey rapidly, but when they hunt together, researcher Oona M. Lönnstedt notes, they "seemed to be polite." Redouan Bshary, a renowned expert on the social behavior and cognitive abilities of fish and with whom I've had some very enlightening and educational discussions about the amazing lives of fish about whom I know very little, notes that fish are much more complex than people give them credit for and that this study, in which turn-taking was observed, could "really shake up old prejudices about the mental powers of fish." So, when someone writes off fish as being dumb, lower, and unfeeling animals, stand up for them and let them know they are wrong, and that solid science tells us so.